It’s pumpkin season and everyone wants healthy low-carb and keto pumpkin recipes. We know you’re busy, so what better way to save you time than finding all the best Keto pumpkin recipes for you. You’re welcome! Before we begin the 39 Best Low-Carb and Keto Pumpkin Recipes roundup, why not learn exactly how to make your own homemade pumpkin spice. 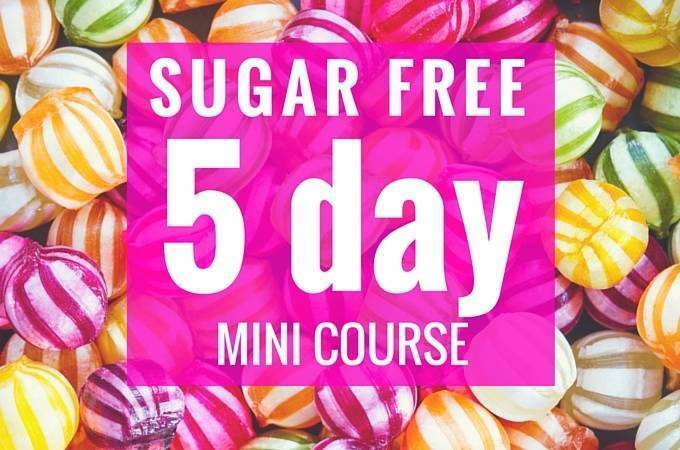 It can be used in a variety of low-carb and keto sugar-free recipes. A small teaspoon can even be added to your daily coffee to give it that va-va-va-voom! 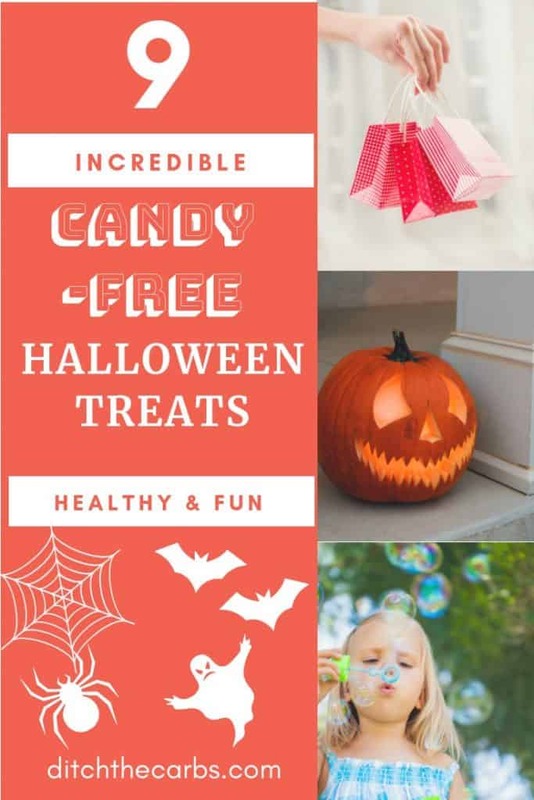 And remember to scroll to the bottom of the post – to see all my ideas for a fun sugar-free Halloween too! 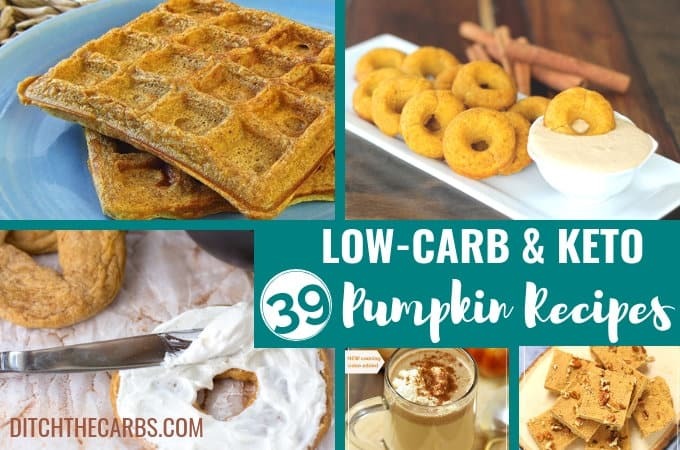 Why Try These Best Low-Carb and Keto Pumpkin Recipes? If you don’t know yet, pumpkins only have about 4% of carbohydrates, which make them a great addition to your low-carb fall menu rotation. It’s why you see so many low-carb and keto pumpkin recipes coming out at this time of year. Instead of just using pumpkins to carve a jack o’lantern this year, why not use the entire thing in a healthy recipe instead? 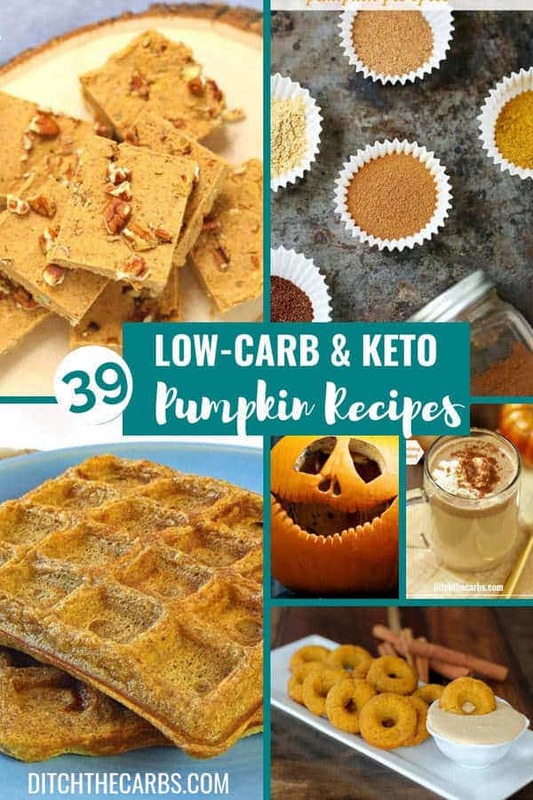 There are plenty to choose from with the latest low-carb and keto pumpkin recipes roundup. You can cook savoury dishes to warm you up or use pumpkins in your favourite desserts and drinks! No matter what the weather, savoury keto pumpkin recipes are always sure to please. My favourite has to be a slow cooker soup. It’s a super simple healthy family meal enjoyed for lunch or dinner. 1: Pumpkin and coconut soup – the perfect slow cooker winter warmer. And it’s such an economical and healthy low-carb dish the whole family will love. And if you love garlic bread with soup, I’ve got you covered! Try my easy keto garlic bread – it’s the no.1 garlic bread by far! 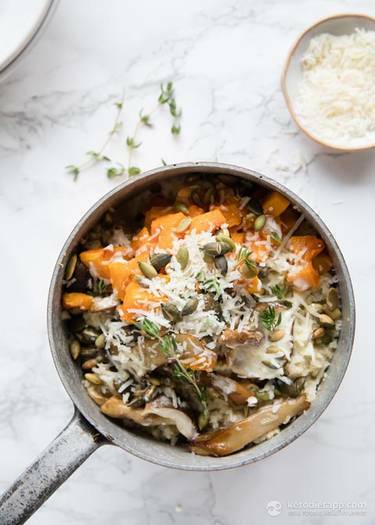 2: Low-Carb Pumpkin & Mushroom Risotto by Keto Diet App – Autumn flavours of roasted pumpkin, buttery mushrooms, and fragrant thyme are cuddled up in a creamy sauce made from a concentrated stock to pack in flavour into this risotto. I love the sprinkling of pumpkin seeds over to garnish. 3: Baked Sausage and Pumpkin Bites by All Day I Dream About Food – These baked sausage and pumpkin bites are perfect for a low carb appetizer this holiday season! Perfect for a party platter. 4: Keto Pumpkin Cheesecake Breakfast Pockets by Keto Diet App – These low-carb breakfast hot pockets are filled with pumpkin cheesecake. Easy to make, grain-free and vegetarian meal prepared in under 30 minutes. 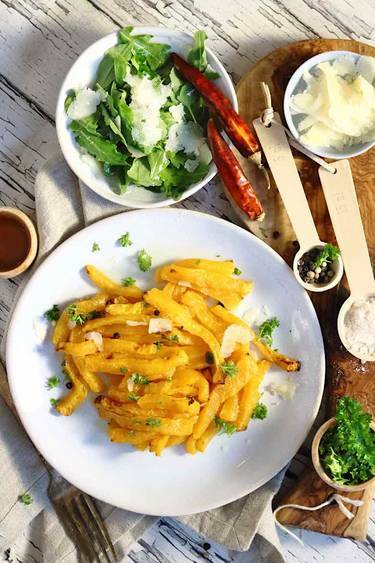 5: Pumpkin Fries by Low Carb No Carb – Easy simple Pumpkin Fries, that goes with almost everything. Add plenty of coarse sea salt, and how about some parmesan cheese? 6: Easy Pumpkin Quick Bread by I Breathe I’m Hungry – This delicious keto pumpkin quick bread is simply incredible. Serve with salted butter, ice cream, or even makes great french toast! 7: Keto Pumpkin & Spinach Cannelloni by Keto Diet App – The sweet roasted pumpkin, paired with the tang of goat’s cheese nestled in a bed of luscious creamy cheese and basil sauce? This cannelloni is worth every second of prep. 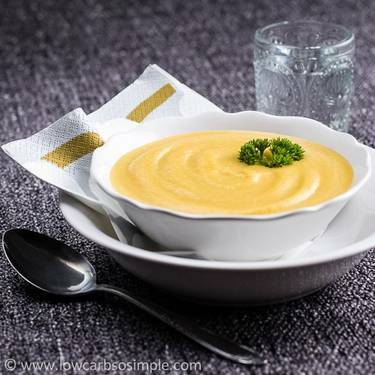 8: Extra Creamy Cream of Pumpkin Soup by Low-Carb, So Simple! – This 4-ingredient take on the old classic is extra creamy — it’s like eating a dream! 9: Low-Carb Pumpkin & Feta Cauliflower Tabbouleh by Keto Diet App – There can never be enough tabbouleh recipes! This one is extra special. Not only is it low carb, but it’s literally bursting with flavour. 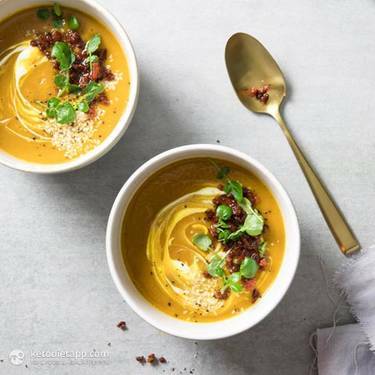 10: Low-Carb Pumpkin Soup with Chorizo Crumb by Keto Diet App – Sometimes you just need a good bowl of comforting soup. This Roast Pumpkin Soup with a Chorizo Crumb has your winter cravings covered. 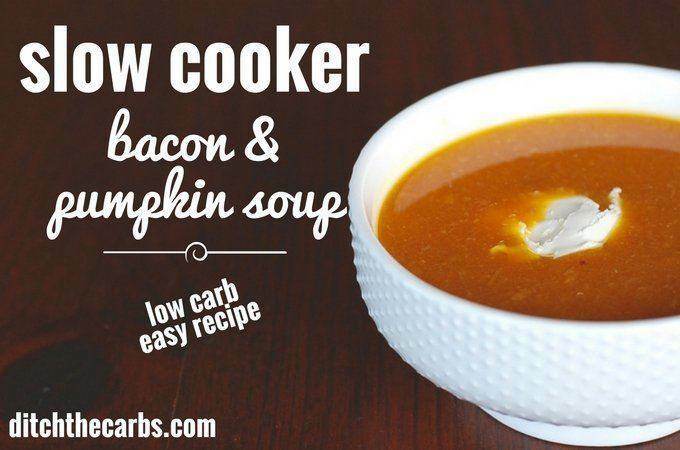 11: Pumpkin and bacon slow-cooker soup – if you ever wanted a cheap and easy meal – this is it! Just throw everything in the slow cooker in the morning, then bam, dinner is ready when you come home in the evening. 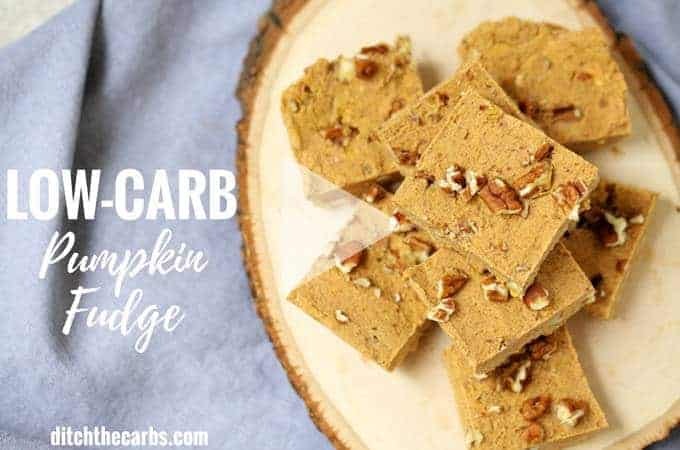 My favourite way to enjoy keto pumpkin recipes by far is to make a sweet recipe, especially fudge! 12: Pumpkin spice fudge – is the quickest and easiest way to whip up a sweet treat when you are having a sugar craving. Watch the quick video to see how a few simple ingredients turn into something magical. They’re perfect to freeze, so you always have a sweet treat available when a sweet craving emergency hits. 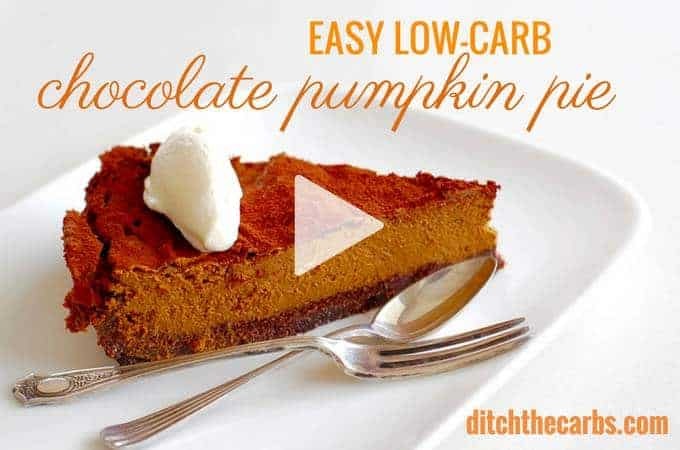 13: Low-Carb Chocolate Pumpkin Pie – this dish pretty much sums up everything that autumn recipes encompass – comfort food the entire family will love. 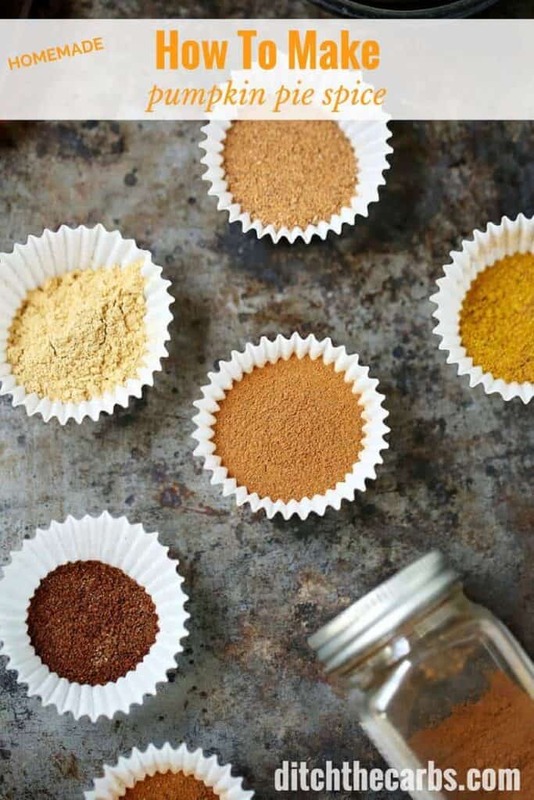 You can even omit the cocoa powder if you want a traditional pumpkin pie spice pie. 14: Pumpkin Cream Cheese Muffins by All Day I Dream About Food – Copycat Starbucks recipe! 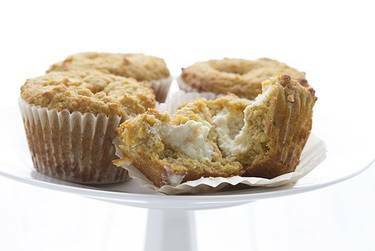 Cream cheese filled pumpkin muffins that taste better than the real thing, with no guilt. I absolutely LOVE the hidden surprise in the centre. 15: Low Carb Pumpkin Bread by Keto Adapt Blog – Imagine the smells in your kitchen as you cook this amazing pumpkin loaf. Great way to start of your day or invite over a friend for coffee. Their mouth will be watering the moment they walk in the door! 16: Easy Pumpkin Fudge by Low Carb Yum – Treat yourself to this simple pumpkin fudge that’s easy and quick to make. It’s sweetened with stevia and contains no dairy making it both keto and paleo friendly. 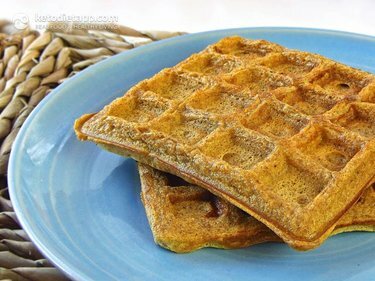 17: Pumpkin Spiced Waffles by Keto Diet App – To make the most out of your pumpkin, try these moist and soft waffles. What would you serve them with? 18: Low-Carb Pumpkin Oatmeal Breakfast Bars by All Day I Dream About Food – Pumpkin all day, every day. Including breakfast! 19: Pumpkin Chia Pudding by Keto Diet App – This recipe is like a small pumpkin pie in a jar. It’s one of the recipes that can be used both as a dessert or for breakfast. 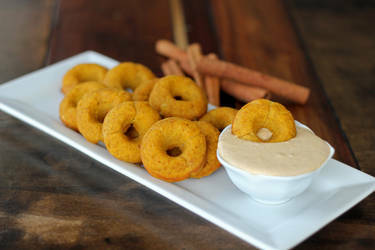 20: Pumpkin Donuts by Keto Adapt Blog – The perfect doughnut recipe for those lazy Saturday mornings. Instead of grabbing a doughnut from the deli, try these pumpkin doughnuts with the pumpkin glaze. 21: Pumpkin Coconut Flour Pancakes by All Day I Dream About Food – These coconut flour Pumpkin Pancakes will make your fall mornings a joy. Serve them with whipped cream and sugar-free maple syrup, YUM! 22: Keto Pumpkin Spice Sheet Cake by I Breathe I’m Hungry – An easy Keto Pumpkin Spice Sheet Cake for when you want low carb pumpkin spice cake but aren’t worried about making it fancy! 23: Low Carb Pumpkin Bagels by My Montana Kitchen. – Dense and slightly chewy, these Low-Carb Pumpkin Bagels are filled with the flavours of Fall. Perfect when toasted and topped with the Whipped Cream Cheese spread! 24: Low Carb Pumpkin Mousse by Keto Adapt Blog – You must try this dessert. It is everything decadent that Pumpkin Pie has to offer without all of the trouble of making a pie crust. 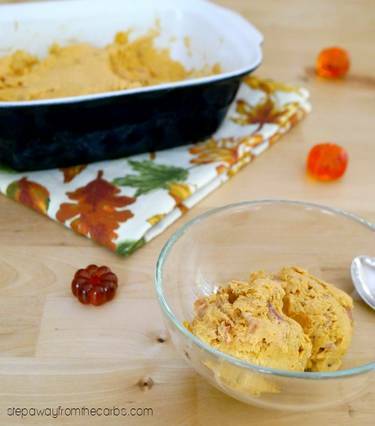 25: Low Carb Pumpkin and Bacon Ice Cream by Step Away from the Carbs – If you love the blend of sweet and salty, try this recipe for pumpkin and bacon ICE CREAM!!! 26: Pumpkin Pie Pots de Creme by Keto Adapt Blog – A decadent creamy “Pot of Cream” you will not regret! 27: The Best Low Carb Pumpkin Spice Muffins by Low-Carb, So Simple! 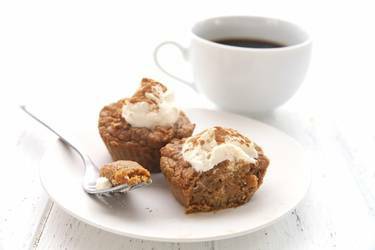 – Can you believe that the best ever Low-Carb Pumpkin Spice Muffins need only 5 ingredients and one bowl? 28: Pumpkin Pie Cupcakes by All Day I Dream About Food – Don’t be fooled just because they are baked in cupcake wrappers! These sweet pumpkin treats are more like the centre of a pumpkin pie, without the crust. 29: Low Carb Pumpkin Cake by Keto Adapt Blog – Do you have a family get together coming up, a fall party? Now, this cake is the perfect showpiece for your company! 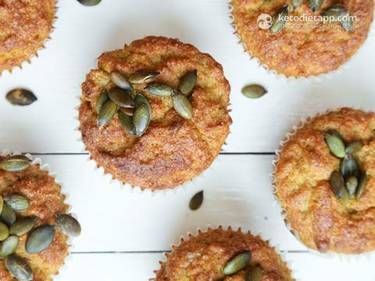 31: Keto Pumpkin Chia Muffins by Keto Diet App – These pumpkin muffins are some of the best I’ve ever tasted! If your goal is to make the dough rise resulting in light and fluffy muffins, you’ll need to be aware of some basic rules. 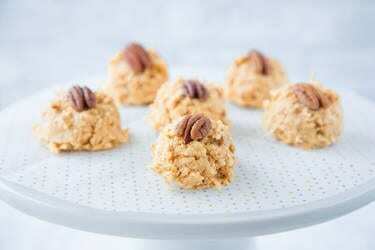 32: Pumpkin Cookie Balls by Keto Adapt Blog – A Christmas cookie recipe turned into fall treat! And who else here LOVES small bite-sized treats? 33: Fluffy 5-Ingredient Pumpkin Pancakes by Low Carb, So Simple! – This isn’t just another low-carb pumpkin pancake recipe: it’s the ultimate low-carb pumpkin pancake recipe! 34: Keto Pumpkin Spice Haystack Cookies by I Breathe I’m Hungry – These no-bake Keto pumpkin spice haystack cookies taste like everything you love about Fall but without the sugar and carbs – or the tedious baking! 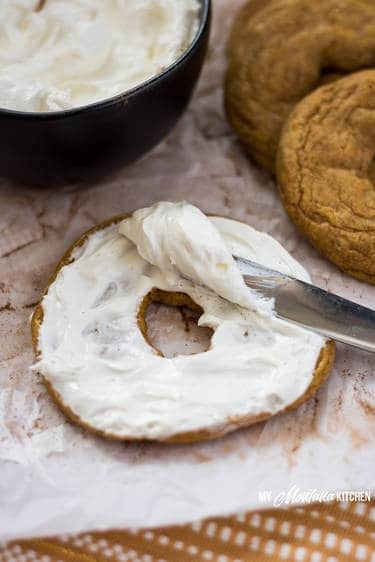 36: Pumpkin Snickerdoodles with Cream Cheese by My Montana Kitchen – Sweet, dense pumpkin cookies filled with a rich layer of sweetened cream cheese. These low carb, sugar-free Pumpkin Snickerdoodles are are the cookies of your low carb dreams! 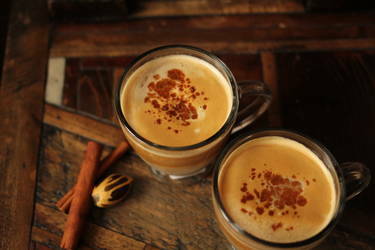 37: Pumpkin spice latte – this healthy homemade version only costs $1 to make and has less than 1g net carbs per mug. Now, who doesn’t want that? The quick blender recipe is so easy, it can be made every day. 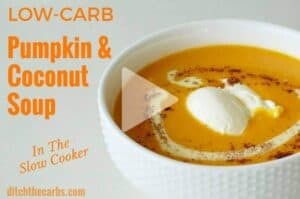 Keto pumpkin recipes don’t get much better than this! 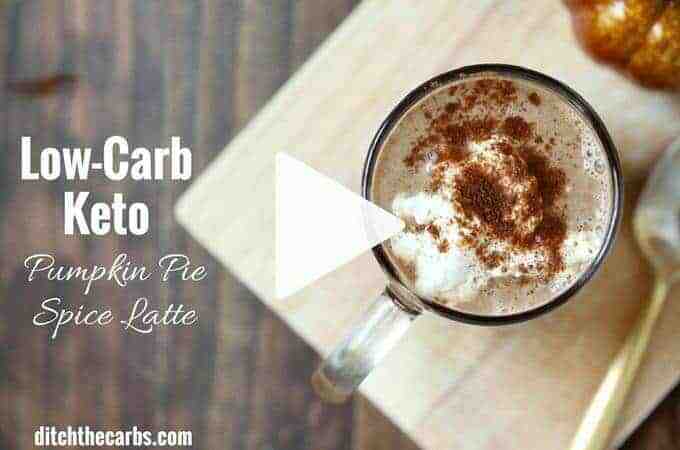 38: Pumpkin Latte by Keto Adapt Blog – What says fall better than a pumpkin latte? Warm up and enjoy this creamy satisfying drink. 39: Dairy-Free Pumpkin Pie Creamer by Keto Adapt Blog – The perfect creamer for the fall, enjoy the calming taste of pumpkin every morning with my healthified pumpkin creamer! No more store-bought, expensive creamers! Want to try a healthy Halloween this year? Or at the very least, cut back on the amount of sugar your kids consume? Then look at these amazing fun and imaginative ideas for party food AND party bags. 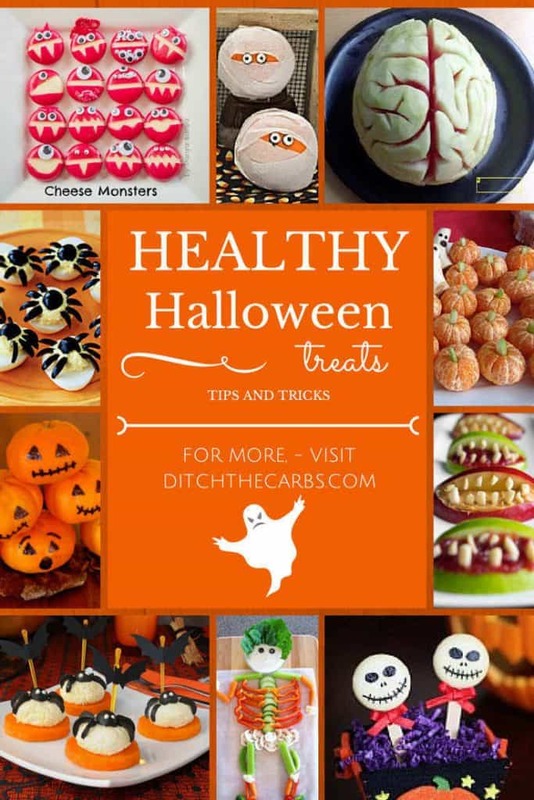 Healthy Halloween Treats – perfect for parties for all ages. I love the edible brain! So leave a comment with your family favourite healthy recipe.